Image captured on 4 February 2019, by the MODIS instrument, on board NASA's Terra satellite. 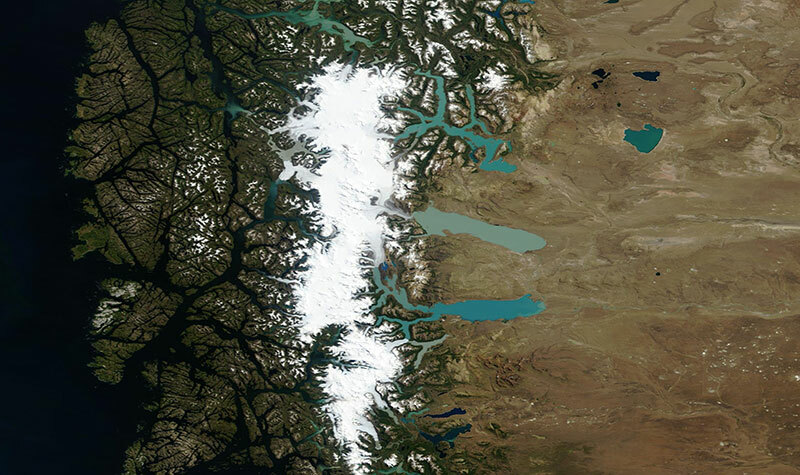 Image of Los Glaciares National Park in Argentina, acquired on 4 February 2019 by the Moderate Resolution Imaging Spectroradiometer (MODIS) instrument, on board NASA's Terra satellite. 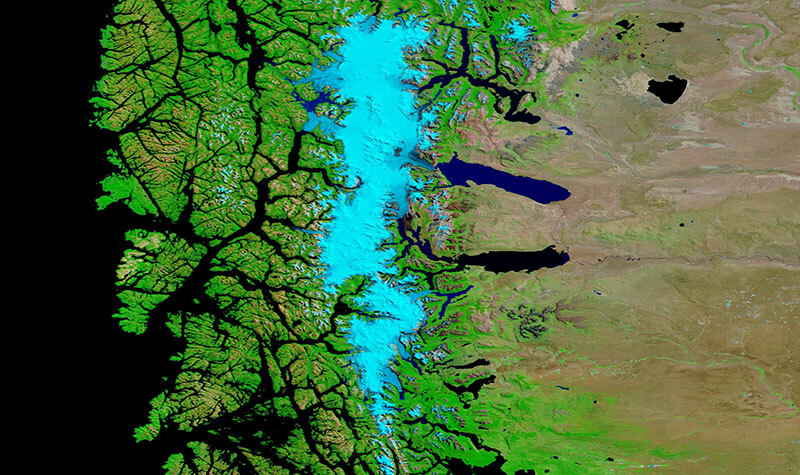 This True Color Corrected Reflectance image shows the park with snowy mountains in the center of the image and glaciers feeding into the lakes. Using the comparison feature, you can use the swipe tool to compare different kinds of imagery from the same day to highlight different features. This comparison has the True Color Corrected Reflectance on the left, and the False Color, Bands 7-2-1 Corrected Reflectance imagery on the right. With band combination 7-2-1 (as seen below), liquid water on the ground appears very dark since it absorbs in the red and the shortwave infrared (SWIR). You can see this with the lower lake of the two large lakes in the center of the image, Lago Argentino, appears black. Sediments in water appear dark blue - Lago Viedma, above Lago Argentino, has sediments from the glacier in it therefore appears dark blue. Ice and snow appear as bright turquoise.